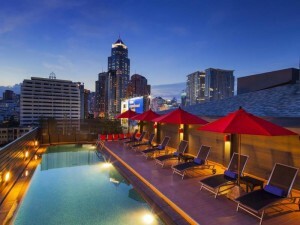 Hotel Solo is a boutique four star hotel on Sukhumvit Soi 2. The hotel is close to Nana and Phloen Chit BTS stations and conveniently located in general. Built in 2009 and renovated in 2013, rooms at Hotel Solo Sukhumvit 2 are clean and have modern furniture and free Wi-Fi. The hotel has a rooftop pool with nice views of the neighborhood. Rooms are mid-priced, making Hotel Solo a good choice for people with medium budgets. Guest Friendly: One guest can join free of charge, but may need to leave their ID card at the reception. Extra guests (above two people per room) pay an extra 1,000 baht surcharge. GuestFriendlyHotelsBangkok.com is a participant in the Agoda Partners program. We may receive a commission for purchases made through this website. © 2019 Copyright Guest Friendly Hotels Bangkok. All Rights Reserved.